Excellence is not only what goes in the bottle. Jonathan would love to play soccer for Manchester United, but his real skill is braiding his daughters’ hair. I lived in France for 3 years as a kid, and saw wine on dinner tables – then got a B.S. degree in Agriculture. Vichon Chevrignon, given to me by my girlfriend (and now wife of 24 years), Susan Pey. 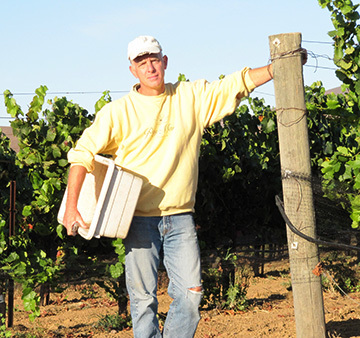 Vichon was its own winery, then bought by Mondavi – and now no longer exists. Jack Davies – founder of Schramsberg and the Napa Valley Ag Land Preservation Fund (1982). I worked for Jack in the 1990s. Jack was a wicked smart, personable and visionary man. He and Jamie Davies founded Schramsberg – and got Nixon to bring Napa Valley bubbly to China! The diversity of my activities – and how nice (almost everyone) is in Napa Valley – even competitors. It’s a wonderfully unique aspect of our business. The lag time between understanding when the consumer is pushing back on prices or styles – and the time it takes to affect that change in the vineyard and cellar. As an industry, our crystal balls are pretty cloudy. Excellence is not only what goes in the bottle. It must speak to every aspect of the product that touches the consumer and community. We do our best to communicate how unique and how small Napa Valley is. People think we are a huge place and are shocked when we tell them we are less than 5% of California wine production. Our second generation is now starting her own Napa Valley wine brand. Playing soccer for Manchester United. But then I’d wake up from my dream. Taste wines from everywhere and from everyone. Build a mental database that can act as your winemaking “style” beacon in the years to come. I grew up in a house with 4 boys and now have 3 daughters. I can braid girls’ hair like no one’s business.